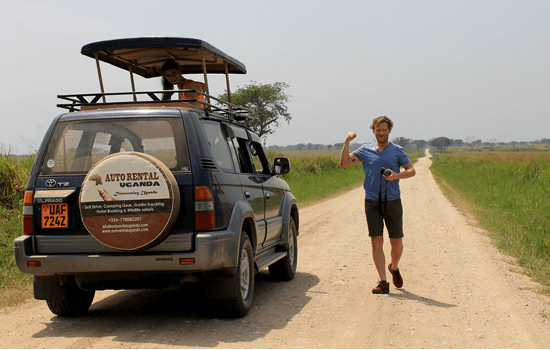 The Toyota Prado Land Cruiser in our Car Rental Uganda fleet is a mid-size four-wheel drive vehicle in the Land Cruiser range. 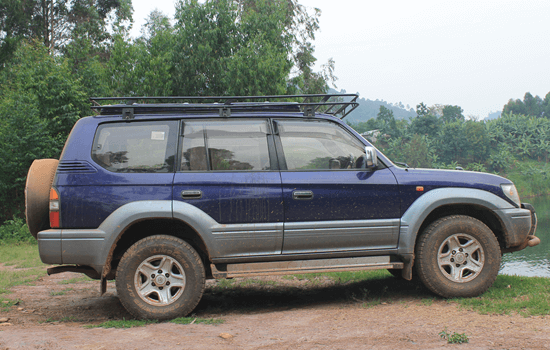 The much spaced full time 4W cruiser is a very economical and comfortable vehicle good to maneuver through the Uganda terrains on self drive car hire in Uganda and Rwanda. We do have both the manual and Automatic transmition vehicles all with same power. The 5 seater and high ground clearance vehicles have enough cargo room, higher visibility and the option of full-time four wheel drive. The best recommendation would be 4 persons that would create great room for the extra luggage. The Cruisers are comprehensively insured, come with a Bradt guide book, Uganda Road map, unlimited mileage, 24-7 roadside assistance, a phone and simcard, great insider tips. We have also re-defined some of the land cruisers and enhanced with Pop-up roofs for game viewing. You do not need to worry about the dust and heat sometimes, they are also Air conditioned with a good fuel consumption capacity.